I came in to ownership of this grandfather clock but have searched the internet world over hundreds of photo's but haven't located one such as this. I am trying to locate the name of the manufacture and approximate year. If you could assist me in any way, I would greatly appreciate it. Comments for Help in identifying this clock, PLEASE! 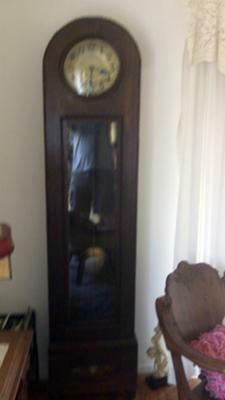 Your grandfather clock looks very much like mine, which I posted on this site a few days ago. There should be a quarter-size metal emblem hanging down from the right side of the clock face. It should have Kohler stamped atop what looks just like the face of the clock. There is very little about Kohler clocks that I can find as yet. I do know that mine was shipped out of Germany after WW2. I don't know how old it is. Sorry. I will keep digging and hope you will too. If you come up with anything, I'd appreciate to hear about you findings.